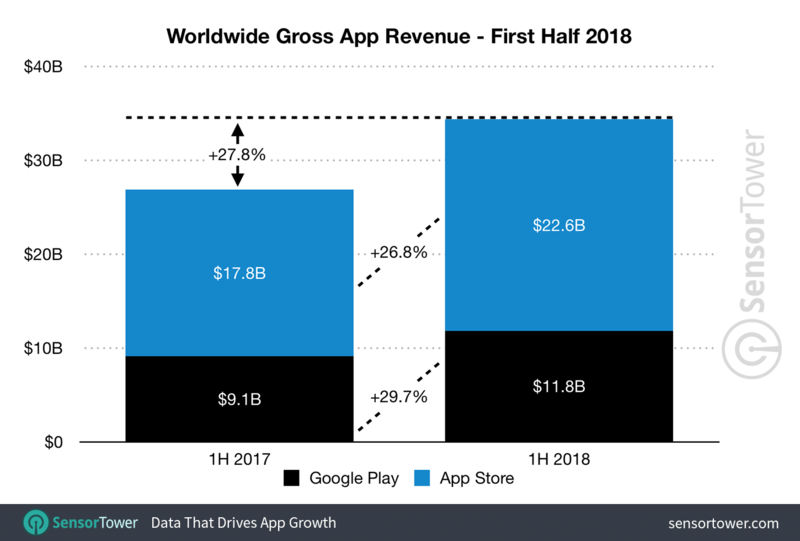 App Store and Google Play users spent a combined $34.4 billion on mobile apps and games in the first half of this year, according to Sensor Tower Store Intelligence estimates. This figure represents a year-over-year increase of 27.8 percent over the first half of 2017, when consumers spent a combined $26.9 billion on both stores. Apple’s App Store saw consumer spending of approximately $38.5 billion last year, nearly double the estimated $20.1 billion spent on Google Play, which, unlike its competitor, is not available in China. In terms of growth, this translated to a year-over-year increase of about 34.7 percent for the App Store, edging out Google Play at approximately 34.2 percent. Consumer spending on Apple’s App Store reached an estimated $22.6 billion worldwide in the first half, which was about 90 percent or 1.9 times more than was spent on Google Play during the first two quarters of this year. Spending on iOS grew 26.8 percent over the same period in 2017, compared to 29.7 percent for Google Play. Netflix was the highest grossing non-game app worldwide in 1H18, followed by Tinder and Tencent Video.